Usually you can lift the other anchor chain up with your anchor, so even in murky water the problem is then clear. Hoisting up the other chain (could also be from a larger vessel or a much heavier dedundant chain from sunken buoy) does put a lot of stress on the yacht. Moreover, it could break out the other anchor! Make a line round the other chain, ease your anchor a few metres and turn the flukes away from the chain. Next get your anchor on deck and drop the other chain. A very handy gadget is a hook you can release under pressure. Also means that you don't have to hoist the other chain to sealevel in clear water. The moment the chain starts taking the weight of the anchor, which is raised from the seabed when hauling up the anchor . A line (chain, nylon or steel cable) used to hold a vessel fast to the anchor. Crewmen assigned to keep watch over the ship while at anchor and monitor the position of the ship to detect movement of the anchor, keep an eye on the weather and other yachts anchored in the vicinity. Substantial mechanical advantage for taking a strain on lines. A few turns of the line are taken on the drum to achieve a purchase, then the winch is turned to bring the line taut. The bitter end of the line can then be secured to a cleat or bollard. The very last piece of the anchor line that is available at windlass. Thus, is a ship is riding out a gale in a treacherous stretch of water with no more line left to pay out, the ship and crew are indeed in trouble when at the bitter end. Scope The ratio between the length of anchor chain and depth. At least a 8:1 ratio is recommended, so when the anchor is dropped at a depth of 10 metres it is advised to use 80 metres of chain. With a kellet you can reduce the scope without reduction of safety. A light line secured to the tip of the anchor and marked with a float, employed to release the flukes when they are fouled on the bottom. 1) Changing direction of the wind clockwise, opposite of backing wind. 2) To lead a line around a bitt or block, thereby changing its direction for a purchase. To take in the anchor chain so that there is a short scope but the anchor remains secure on the bottom in preparation for departure. Hekanker, ankeren in span, voorkomt ook dat het anker onklaar wordt omdat je niet over je eigen anker kan drijven. anker ingraven on beach or behind rock. 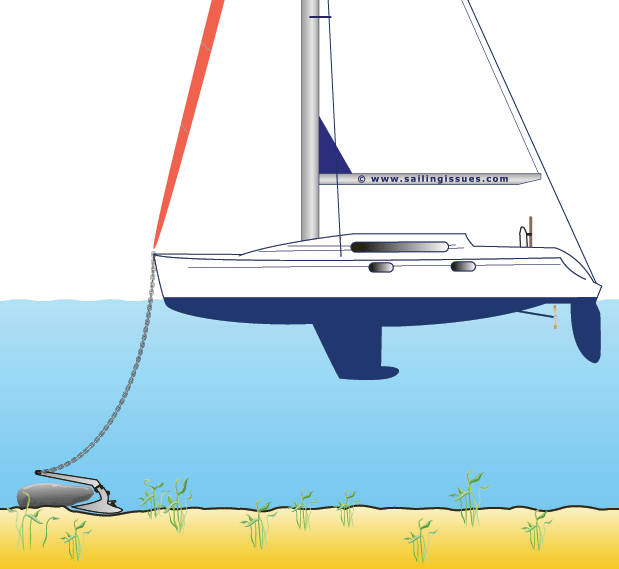 when moored near ferry quay use second anchor a weight to lower angle of chain, this pulls the yacht away from the quay. Note that anchor etiquette gives priority to the first boats in the anchorage. If you arrived after another boat, and there's interference between the boats or their anchors, it's incumbent upon you to move or otherwise correct the situation. The ship should carry at least two different anchors to suit a wider variety of seabeds. No single anchor design is best in all conditions. By far the best combination is a genuine! Danforth with a CQR. A Bruce anchor is useless and unacceptable, but can be handy as a third anchor in very calm conditions because it is so easy to set and handy on a rocky seabed. For a 45 feet sailing yacht the anchor chain should be 80 metres minimum, for a yacht of 35 feet a minimum of 60 metres is recommended. Most charter yachts in Greece are fitted with shorter chains → find reliable charter agencies. should be of a good brand and size (Performance 37, Fortress FX 37), and not the usual cheap and dangerous imitation! should at least have a stock of good length, if the stock doesn't protrude well from the flukes (>10 cm at both sides) the anchor is useless and will simply skid along the seabed on its side. preferably have an adjustable fluke angle that can be changed from the normal angle of 32 degrees to a soft or muddy seabed angle of 45 degrees (like the Fortress FX) . There should be no main anchor. The stern anchor plus rode must be as safe and reliable as the bow anchor when used without a second anchor.